If you're anywhere near Los Angeles you can check out Bob's famed guitar that's on loan from Jamaica to The Grammy Museum that's located Downtown Los Angeles very close to where the Los Angeles Lakers/Clipper play at Staples. Read more about that here. If you're in Jamaica you really outta go to Nine Mile where you can check out his childhood home and even look at the bed made famous in the song, "Is This Love." Check out my blog post about Nine Mile that I did a few months back at Visit Bob Marley's Final Resting Place. 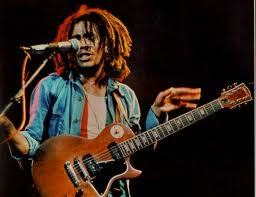 Live on Nesta Robert Marley!